The Springfield Science Museum is home to the Seymour Planetarium, the oldest operating planetarium in the United States. 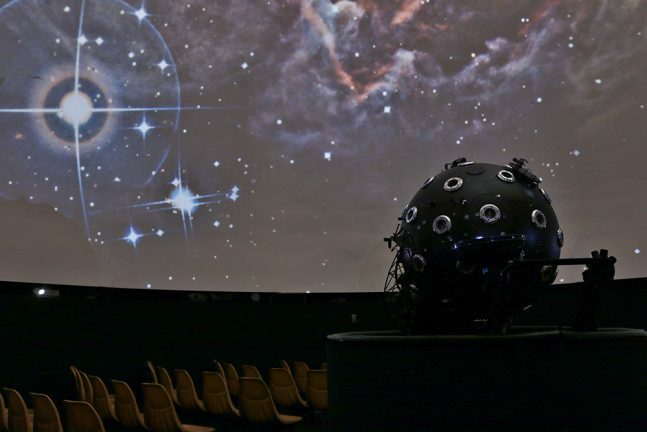 The star ball in the Seymour Planetarium can project more than 7,000 stars which vary in brightness. What is that you’re seeing in the sky at night? With the planetarium stars as the backdrop, find out how to locate and identify celestial objects, planets, and constellations as the seasons change. Recommended for ages 8 and up. Dinosaurs ruled the Earth for nearly 200 million years and then, in the geological blink of an eye, they were gone forever. Travel far out into space, deep inside the earth and back in time as we try to unravel the mystery of the disappearing dinosaurs. Recommended for ages 8 and up. Fasten your seat belts as you embark on an incredible journey through time and space. Investigate theories about the creation of Earth, explore evidence that life on our planet began in the depths of the oceans, and speculate about life in the farthest reaches of the universe. Recommended for ages 8 and up.